Jamaica’s government is going greener. The country announced recently that it would join the Solar Head of State coalition and install solar photovoltaic panels on the island’s national executive office, Jamaica House. The announcement comes in keeping with the island’s promise to transition to 30 percent renewable energy by 2030. Jamaica House was built in Kingston to be the official office for the Prime Minister of Jamaica after the country gained its independence in 1962. Solar Head of State partners governments with solar technology companies, local installers, major climate NGOs and foundations to offer professionally installed solar systems on the residences of heads of state or government around the world. With support from its partners, Solar Head of State will install a donated 15kW grid-connected photovoltaic system on Jamaica House, ultimately saving the government thousands of dollars on energy expenditures. Jamaica also plans to implement energy projects identified at COP 22, where delegates from 195 countries met to discuss the recently adopted Paris Agreement. “I’m so pleased to see Jamaica setting such a great example,” said Virgin founder Sir Richard Branson, a leading advocate for green energy in the Caribbean. 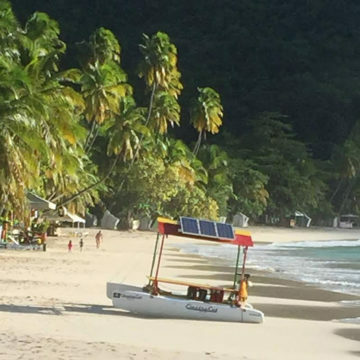 The installation work will be undertaken by U.S. firm Solar Island Energy, working with the National Energy Solutions Limited – an agency of the Ministry of Science, Energy and Technology – and Envisage Energy – a local Jamaican company focused on building the island’s sustainable future. The project is supported by Elms Consulting, a London-based strategic consulting firm working to accelerate sustainable development on islands. The solar PV panels for the Jamaica House are being donated by Trina Solar.